TONY can not be trusted at all!!!!!!!!!!!!!!!!!!!!!!!!!!!!!!!!!!!! ALLAWI is going to try and stop everything MALIKI does until he completes the arbil agreement.The RV will not happen until one of these guys give in or done away with.Maliki doesn't want the people to prosper due to poor people being easier to control. It is a shame that the moderators of this site would disallow my response to this topic here in america! I can not believe that our government is so corrupt and sick as to even consider the mosque situation with the terroristic MUSLIMS.The mayor of NEW YORK is a muslim sympathiser and should be expelled from AMERICA along with every damn MUSLIM in our country.The mayor has openly stated that CHRISTIAN PRAYER will not be part of the agenda to recognize 9/11 .I believe that when attrocities of this nature are allowed to go unchecked that the AMERICAN PEOPLE SHOULD CONSIDER "CIVIL UNREST" TO PROTECT OUR RIGHTS AND CONSTITUTION. The islam and muslim influence is showing up all over the place,they need to be STOPPED AND EXPELLED FROM AMERICA !!!!!!!!!!!!!!!!!!!!!!! Just another prime example of the policed dictatorship in which we americans now exist under.The feds operate behind an unreal screen called democracy. VOTE FOR RON PAUL!!!!!!!!!!!!!!!!!!!!!!!!!!!!!!!!!! Careful ,I agree with you,but the idiots on this site will crucify you for not wanting their liars on this site!!!!!!!!!! He should start with his friend AL-SADR!!!!!!!!!!!!!!!!!!!!!!! 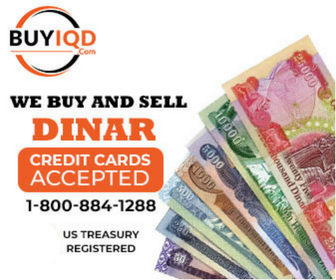 If IRAQ has 30 trillion dinar and they RV even at a 1 dinar to 1 us dollar ,that would be 30 TRILLION DOLLARS.Then consider all the dinar being held by investors !!! TRUMP alone was reported to have 30 million dollars worth of dinar. MY QUESTION IS,is it really possible to create this much money with the flip of a switch????? What if it rv'd at 3 to 1us ,that's a lot of TRILLIONS!!!!!!!!!!!!!!!!!!!!!!!!!! OKIE CONTAMINATION ON THIS SITE!!! I believe it is irresponsible of the DINAR VETS site to allow OKIE and his followers to continue posting their lies and propoganda on this site.I understand freedom of opinions and sharing of information as related to the dinar but what they are doing is blatant abuse of freedoms over and over again.I think there are alot of good people on this site that would wish for ADAM to consider this request of not allowing this to continue. YES,ABSOLUTE REQUIREMENT.PLEASE GET ON BOARD WITH THE TREASON CHARGES THAT HAVE BEEN FILED AGAINST OBAMA!!!!!!!!!!!!!!!!!!!!!!!!!!!!!!!!!!!!!! RON PAUL IS OUR ONLY HOPE AT THIS TIME!!!!!!!!!!!!!!!!!!!!!!!!!!!!!!!!!!!!!!!!!! Is this saying IRAQ is out of chapter 7 and can trade internationally now????????????????? ?